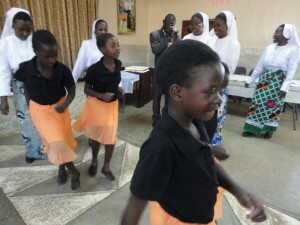 The aim of City of Hope is to educate and develop the full potential of the lives of poorest young people, especially the orphans and vulnerable children, who are the most disadvantaged, by promoting their dignity and rights through education and skills training, in consideration of the gender equality, health awareness, their social integration, as a positive framework in the fight against poverty and the HIV/AIDS pandemic. 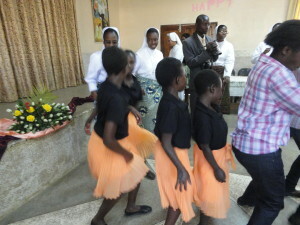 In 1995, thirteen and a half hectares of land was allocated to the Salesian Sisters in Makeni, 10 km south of Lusaka, for a Project for Girls-at-Risk, by the Lusaka City Council. 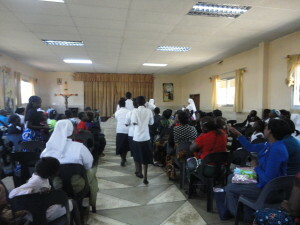 A hall, sponsored by Canada Fund and some other Organizations, was built, with two adjoining rooms at the back that served as a house for the Sisters for 5 years. Some of the Embassies and Well Wishes, contributed towards the ‘insaka’ (round huts), built as classrooms for an Open Community School. In May, 2005, the first Community moved to the new site. A two-year Skills Training Course, offered for young women, between the age of 17-25, consisted of Tailoring, Home Management and Agriculture. The hall was used for the Skills Training. The 11 ‘insaka’ were supposed to be ‘open’ classrooms, but as Makeni can be very windy, they had to be built up. They were meant for 12-15 children of the Open Community School, that caters for children who are over the age of 9 years, who had not been going to school, and who were beyond the age of entering the government schools. Furthermore, the feeding programme caters for a thousand people a day. 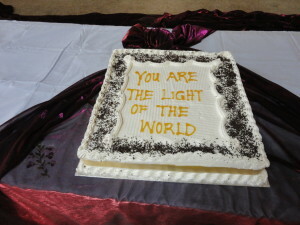 Food is donated by the World Food Program and from the Donor Organizations that sponsor the Project for running costs as well as from friends. City of Hope has a small farm where crops are produced and the animal farm provides meat. About 260 girls came to be registered. The local Community came forward, as volunteer teachers, and so the Open Community School was started. Over the years, all these volunteer teachers, have managed to improve their own education and they are now all trained and are qualified teachers. Each year, more and more applications were received. The community asked us to open our doors to the boys who were out of school, so in 2004, we started afternoon sessions to cater for the extra numbers. Over a period of four years these children cover the syllabus of the seven years primary schooling. They write the Government Grade 7 Examination. In 2006, in order to facilitate these children, we started Grade 8 and Grade 9 classes, so that these young people are able to complete their basic schooling. We tried to insert them into the Government Schools to complete the last three years of Secondary Education. The first girl sent to live at the Centre was brought by Red Cross International. The other girls were referred to us by the Social Welfare and through other Organizations. The numbers have grown over the years until we had 86 girls. Our policy is not to be an Institution or an Orphanage, but rather a ‘home’ where the girls feel secure and loved, and where they can grow in self-esteem and be prepared to be re-inserted into society. We do not have an age-limit, as City of Hope is their home. Once they are ready to ‘make it on their own’, they move from here. Over 150 girls who passed through City of Hope, have already been re-inserted into society. The temporary facilities, that accommodated the girls were replaced with beautiful buildings sponsored by Madre Salva, (Spain), Missio (München) and the Salesian Missions Prokur in Bonn (Germany). The Beit Trust (England) sponsored the Staff house and one of the Volunteers houses. The Japanese Embassy provided extra ablution facilities. Funding from the Belgian Government, through DMOS COMIDE enabled us to put up the Skills Training Centre. The Kitchen and Dining Hall for the girls was donated by Swedish Caritas, Stichting Cordaid (The Netherlands), the Irish Missionary Resource Service, the Irish Ambassador, Jugend Eine Welt (Austria) and St. Giacomo Parish (Italy). Our benefactors, who wish to remain anonymous, have assisted us with funds to enlarge the Convent. The facilities for the Poultry Project was sponsored by the British High Commission and facilities for the other animals from Canada Fund. Msgr Fernando Berardi and Holy Family Parish, New Rochelle, N.Y. sponsored the enlargement and renovation of the Hall with the help of Fr. Vincenzo Speranza and the Organization of Diplomatic Spouses, Melissa and Carol. To run such a project, 60 people are employed, plus the Volunteers and Sisters. As we have no fixed income, we run on Providence and are most grateful to the donors and sponsors from Swedish Caritas, the Salesian Mission Offices in Poland and Germany, Jugend Dritte Welt and Don Bosco International, Jugend Eine Welt, the Jesuit Mission Office in Ireland, the Capuchin Mission Office in Ireland, St. Eugenia Parish in Stockholm (Sweden), Red Deporte y Cooperación in Spain, VIDES, Ireland, Global Fund for Children, Holy Childhood, as well as friends and our Volunteers, past and present, who have been very generous in their help. Nicholas Leonard, Mary Deane & Martin Moore, walked across Ireland to raise funds for CoH and our past pupil: Angelique Mukandamage and friends in USA organized different events to raise funds. Our present project is the building of a NEW SCHOOL, to replace the temporary structures that we have been using for 15 years. We commenced the first phase (one classroom block and the boys toilets) in August, 2009 and are most grateful to Mons. Nicola Girasoli, Ambassador of the Vatican Embassy, Missean Cara, a Family who which to remain anonymous, the Rector Major of the Salesians of Don Bosco, through the Salesian Mission Office in Spain, the Irish Anglican Bishops Appeal and Symphasis Foundation through Jugend Dritte Welt and the Salesian Mission Office in Bonn. A two classroom block was donated by James Nesbitt through UNICEF and was overseen by the Ministry of Education. We are now looking for funding for the next block of classrooms and the girls toilet. Once we have the necessary infrastructure, the Ministry of Education will be able to accept us as a grant aided school, that will enable the school to be self-sustainable.